Leeds/Bradford airport unscathed by airline review … but what next? They’ll be breathing a sigh of relief up at Leeds/Bradford airport. Monarch airlines announced today that next year it’s maintaining the number of summer flights it’s been running from the airport this year. With too many planes chasing too few passengers, Monarch has been carrying out a “strategic review” of its operations as it tries to turn itself into a low-cost airline. Staff, including pilots, have already accepted pay cuts and changes to their conditions in an effort to help secure the future of the travel group, which looks set to be bought later this month by a business that specialises in turning round underperforming companies. So, after the airline announced it was stopping flying from East Midlands next year, it was no surprise that questions were asked about whether Leeds/Bradford was about to suffer the same fate. The airline is going to be flying 10 routes from LBIA next summer (down one from last year). In come two new ones – Alicante and Venice – out go Lanzarote (Canary Islands), Bodrum (Turkey) and Heraklion (Crete). The end result is that there’ll still be 28 flights a week. 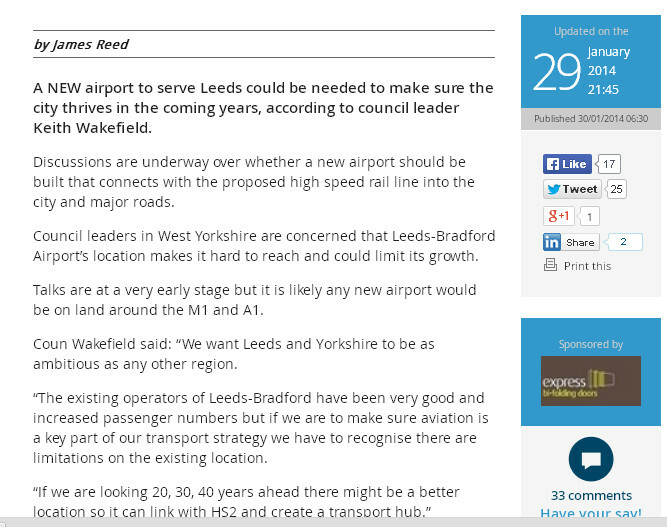 Where does all this leave Leeds/Bradford airport – apart from relieved? Funnily enough, Leeds City Council’s bosses are discussing the airport’s future tomorrow. They’re not announcing anything new, just nailing their colours firmly to the airport’s mast (do airports have masts?). Gone is the unfortunate chat earlier in the year (instigated by the council – see panel right) about West Yorkshire maybe needing a new airport in a new location some time in the future. It’s now all about helping the airport in Yeadon fulfill its potential. How big is the potential? It depends on who you believe … if anybody. When the airport issued its Masterplan in 2005, it forecast that passenger numbers would almost double to 5.1 million per year in 2016 and to 8.2m by 2030. 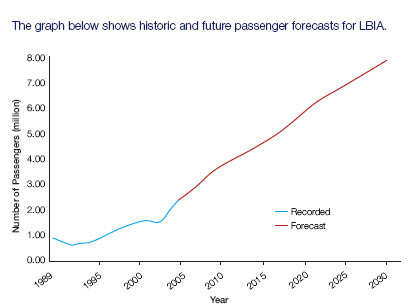 A 2009 report by consultants Arup forecast that if terminal facilities were improved, 5.1m could be using the airport by 2013 and very nearly 7m by 2020. Government projections issued in January last year – and reproduced in a report for tomorrow’s council meeting – say that over 9m MIGHT be using the airport by 2050. Pie (chart) in the sky? Quite possibly. All we know is that the airport’s use is growing, but at 3.3m passengers a year, it’s only the 16th busiest in the UK. There are two important things that have to happen for any of these predictions to have a cat in hell’s chance of coming true in the long term – and both seem mired in uncertainty. First, the airport’s facilities have to be expanded and improved. 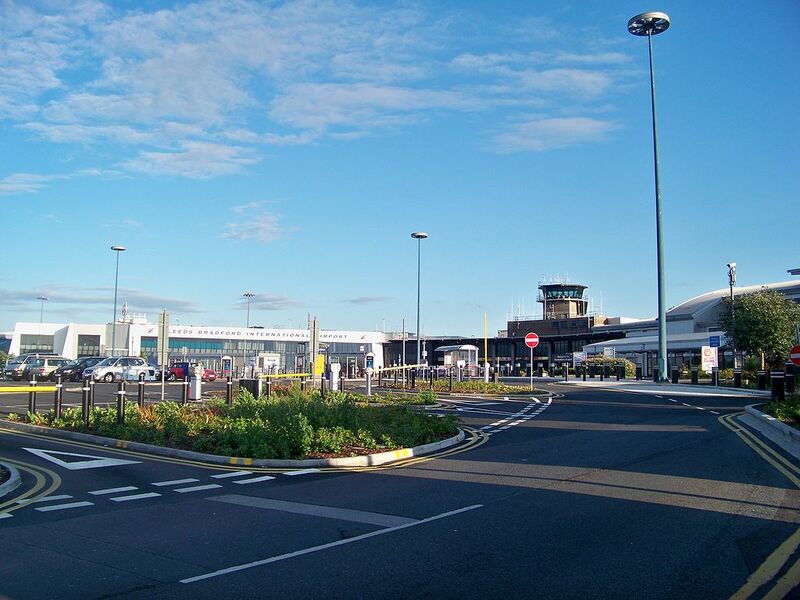 With a view to doing just that, the airport’s owners, Bridgepoint Capital, were granted planning permission to build a new two-storey extension to the terminal building at the end of 2009 – nearly five years ago. Two years ago they got the permission extended for a further three years. They’ve now got a year left to get on with the job or face having to go through the whole planning process all over again. The second thing that has to happen is that getting to and from the airport has to be made loads less painful. And it’s still just that – a theme. The government’s looking at road and rail options to the airport, but no-one knows when it might make up its mind to do anything – or not. The aviation minister says a rail link is “obviously desirable” but “we have to look at other airports and priorities as well”. And a rail/light rail link to the airport is listed among the transport objectives of the north’s “big five” council leaders (Manchester, Sheffield, Newcastle, Liverpool and Leeds). They’d like it by 2024 … but they’re not paying for it. As for better roads to the airport, work has begun “to investigate the detailed investment case and justification for an airport link road,” the report says. “The work will also identify the range of options available for improving road access and set out the initial options for the routing of a link road with a view to moving towards more formal public consultation during 2015/16,” it adds. We should probably not hold our breath. So, having Monarch commit to Leeds for another year will be seen as a relief: having three low-cost airlines (Ryanair, Jet2 and Monarch) is better than relying on one. But there’s a long, long way to go before the aspirations some people have for the airport – the YEP was talking last week about it becoming “the international travel capital of the North“! – have much chance of becoming reality. 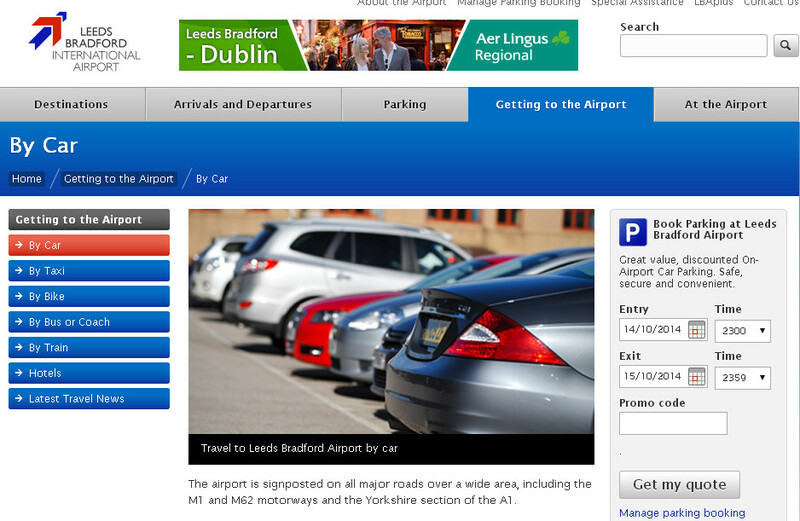 This entry was posted in Uncategorized and tagged LBIA, leeds, leeds city council, leeds/bradford airport, Monarch. Bookmark the permalink. 4 Responses to Leeds/Bradford airport unscathed by airline review … but what next? None of it is audited, no one explains the methodology, we’re just expected to take it all on trust. It seems to me that we owned a small, regional airport with potential, and got a price for that, and now the taxpayer is going to foot the bill to vastly improve that potential and product, with the owners reaping many of the benefits. If I sold my house for a fair price, I wouldn’t like to be charged years later for the new owners wanting an extension. Why couldn’t we have done the improvements first, improved the place, then sold it on for more, recouping the costs dramatically? On a completely unrelated topic, the owners are now Bridgepoint Capital. Tory grandee Chris Patton is a director of Bridgepoint Capital. On a really unrelated note, LBA is the best airport for me because, in Shipley, I live close – but it’s still a bugger to get to. The roads to and from are rubbish and there is no rail link, so it doesn’t attract people, really, from outside Bradford and Leeds. In Parliament, MP for Scarborough & Whitby said his constituents can get on a train and get off at Manchester Airport terminal, making a much more attractive proposition without even bringing in the choice of destinations; and I wonder if there is any difference in time between going as far as Liverpool even if it is much further when compared to LBA. The airport is in the wrong place, it always has been (originally the Yeadon site was the least preferred). We need to seriously consider building a new airport at church fenton or sherburn that can be more easily served by road and rail and doesn’t cause pilots the problems of landing on top of a massive mountain!! 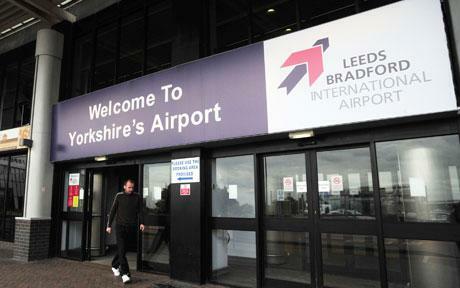 LBA could still be a secondary airport but it hasn’t got th ability to ever compete with other, better located sites. Shame NGT money can’t be spent linking it though…they;ve prob spent £98million on the inquiry!